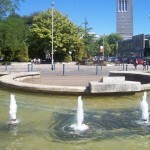 As Plymouth lighting specialists, G&R Electrical Wholesalers was approached by E-Serve Electrical Contractors to quote and help design a colour changing lights system for the Plymouth City Council fountain. The San Sebastian fountain is situated on the main walkway from the city centre to the Plymouth Hoe on Princess Street, and was certainly in need of some colour to deliver a real impact. Our first task was to proceed to the site and investigate the pond with a view to installing our wholesale colour changing lights. 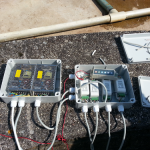 The existing wiring and junction boxes from the previous lighting system were waterlogged and needed to be removed, while two of the existing water pumps were defective and in need of replacement. Our team discovered there was insufficient cabling running from the control cabinet across the road and this was the first task we tackled. We were seven cores short on the amount required for our colour changing lights system, but after discovering an unused tube which fed directly to the control cabinet and sourcing a 1.0mm 7core rubber h07 cable, we eventually managed to fit it down the tube with a bit of extra help from some cable lubrication. 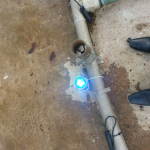 When it came to the colour changing lights, we noticed a single fixing point on the side of each water jet and managed to locate a 6w colour changing LED fitting, complete with an ip68 submersible water rating. 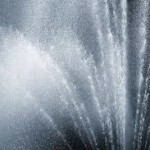 The fittings are made from high marine grade 316L stainless steel to ensure longevity and, more importantly, we were able to mount these straight onto the fountain jets. We were able to keep the costs down by having close links with the manufacturers in China, who made the fittings to our specification. Finally, the e-serve team wired the fittings together with ip68 connectors and junction boxes using a water-proofing gel compound to ensure no water ingress. The job, which also involved sourcing some replacement pumps for the system, which E-serve fixed in to place with a uni-strut system, was finished to contract and on time, ready for the colour changing lights to be unveiled to the council. Have you got an LED lighting project you’d like assistance with? Here at G&R Electrical Wholesalers we’re lighting specialists, happy to help with any project, big or small. Get in contact with us today to learn more about our services and to obtain a free quote.